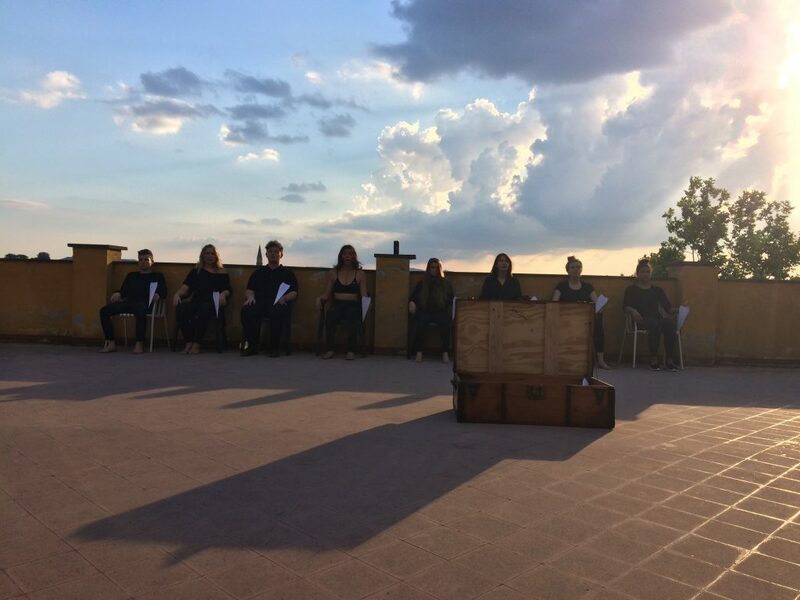 Below Rebekah Dawn shares her thoughts on the second site-specific performance we’ve seen this summer: The Devising Grid. Picking up from the post, the amazing thing about having site specific performances at the Villa Godiola is the potential they have to speak more deeply to the students. Living and training on site with both students and faculty is a creative incubator in and of itself. But getting to see the performative product of the artists you are getting to know personally turns the power on the incubator up a notch. During meal times and evening lectures we are able to engage the faculty about their aesthetic and artistic values. Through relationship with the other students, we are privy to the process that is used to create the pieces. By the time the performance comes around, we are able to view the product from a more enlightened place. It is incredibly educational to spot the isolated elements that are the building blocks of the piece, and contemplate how they came together. We are seeing the artistry happen in front of us, the craft unfolding in front of our very eyes. The value of this for current and aspiring arts practitioners is priceless. “Reflections of Self” took place at the end of the second week of the intensive, and was the culmination of the Devising Grid physical theatre workshop. Created under the direction of Leigh Fondakowski and Dory Sibley, it was built using moment work straight from the Theatre Tectonic source. This piece was comprised of 21 moments that took place in different spaces in and around the villa and reflected the actor’s past, present, and future selves. The show began in the Teatrino with a corporate visual experience for the audience. Then the audience was given a map of the performance art gallery and dispersed to peruse at their discretion the durational performances at various sites throughout the villa. Finally, the audience reunited for a guided tour of a succession of moments in a new thread of various sites. This piece featured mostly solo work and a few duets. As the moments were autobiographical, they were raw and deeply personal. It was almost like looking at snapshots of each individual’s deepest secret, perusing the catacombs of the actors’ memories of things left unsaid. As the audience progressed to each new site, we encountered along the path echoes of previous moments, suggesting the completion of the moment in time, sometimes capturing the longing for what the moment could have been. What was harrowing about this piece was the brutal honesty of each performer as they shared the secrets of their souls through physical actions. In one moment an actor was upturning and rearranging four different couches, the cushions from each strewn about the room. In another moment an actor, sprawled on the floor, buried her face into a bouquet of silk roses. In a third moment an actor sat upside down in a tipped over armchair chair on the roof of the garage, tapping a tambourine on her chest while pulsating and breathing heavily. In a fourth moment an actor lying in the vineyard was sieged by an actor reaching through the row of grape leaves. As the moments were embodied with little to no text, the precise context of these autobiographically inspired events was an artful mystery. But the common theme I discerned between them was something of an “unravelling” or “coming undone.” The moments seemed to represent either the cause or effect of the stripping away of self, leaving the individual to wrestle with what lies beneath. An aspect I particularly liked was the progression of each moment over time. During the guided portion we were lead back around to prior moments to see how the moment developed into something different. The site with the tipped back chair on the garage roof had shifted to reveal the chair in a new place and the actor clothed with all the brightly colored pieces that had been previously skewed about the roof. There was a moment early in the guided portion in which an actor became compelled by a pair of yellow rain boots in the middle of the room. The moment begged the question of what the boots meant to the individual, and what she was to do with them. Later on the tour we passed by the same actor sprawled out on the staircase in a catatonic state, the boots in her possession. In another moment progression, we first encounter an actor standing still as a statue outside, holding a staff in one hand and a piece of white paper in the other which is blowing in the wind. Later we find this actor on the lawn surrounded by pieces of white paper which he is actively folding into paper airplanes. The third manifestation of this moment comprised the closing of the show, in which the Teatrino rooftop terrace was artfully used once again. As the audience was lead up to the terrace, we brushed elbows with an actor whispering “Let go,” a broken mirror beside her in which we could see our reflection. On the roof we were met with the sight of all of the actors sitting in a line, white paper airplanes in their hand. In the middle of the terrace was a large wooden chest, lid open, dozens of paper airplanes inside. In unison, the actors slowly rose out of their seats, and while whispering “let go” in cacophony, turned toward the valley and released their paper airplanes into the sunset. In a single act that concluded the performer’s journey and encouraged the spectators to pick up where they left off, the audience was invited to collect their own paper airplane from the chest and release it from the rooftop ledge into the sky. While this representation of letting go must have meant different things to different people, not a single eye was dry in this final collective act. Once again, the villa held a level of enchantment that allowed for everyone’s best self to be released.